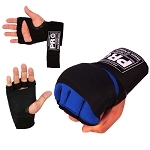 Pro boxing hand wraps add protection and stability to every punch you throw. With a pair of hand wraps, you’ll be better protected against sprains and fractures. Our professional boxing hand wraps come in a range of styles to accommodate different preferences. We offer both class cotton hand wraps and Mexican-style hand wraps. With proper wrapping technique, you can keep your hands safe with our durable pro boxing hand wraps throughout the hours of practice ahead. For competition, we also offer professional-grade gauze and fight tape to keep your hands safe during in the ring. Shop our selection of professional boxing hand wraps below.